Tips & Tricks - "How to Stop Oily Skin"
​When you have oily skin and acne, it's imperative to select the correct skincare, powder and makeup for oily skin types. Did you know? Skin oils actually disintegrate the chemical composition of makeup. This is why most waterproof makeup removers contain some form of oil base - because it breaks down the product, allowing for easy removal. If the wrong types of makeup are used on oily skin, sebum builds up and the products succumb to a sticky texture - which then fades and streaks. Read below to see tips & tricks on makeup for oily skin that will keep your complexion looking fresh & matte for hours. 7 Steps for Shine-Free Skin that Stays Matte! Exfoliation is your best defense against a sallow looking complexion that's prone to blackheads and breakouts. When dead skin cells merge with skin oils, this sticky mixture become lodged into pores. If pores are clogged with this glue-like substance, they can't obtain oxygen and acne bacteria festers - triggering breakouts. The fine grains in exfoliator whisks away these dead cells, to help prevent pore clogs. It also loosens existing blackheads for easier removal. Splash face with warm water and use an exfoliator such as St Ives Apricot Scrub or Mattify! Cosmetic's Bamboo & Green Tea Exfoliator. Rub in circles all over face, concentrating on chin, cheeks, forehead and sides of nose, where dead skin is most likely to accumulate. Rinse thoroughly and then dry vigorously with a fluffy towel. Thin skin reddens easily will benefit from 3x weekly exfoliation. Thicker skin types can tolerate exfoliator up to 2x daily. After use, skin will feel soft and replenished. Regular exfoliation also helps Toner (Step 2) absorb more completely into pores, for maximum results. ​Toner disinfects pores and then seals them, to help prevent makeup and dirt from clogging inside. One of the best toners for oily skin is Proactive's Revitalizing Toner. It balances pH level to discourage the growth of acne bacteria, and prevents skin from becoming dry and flaky. Avoid applying any toners which contain alcohol, as alcohol causes even more oil production, and actually seals pores so tightly that dirt gets trapped inside. If you prefer an all natural toner, try using Apple Cider Vinegar (ACV), which acts as an amazingly effective toner for oily skin and also balances pH levels. The components in ACV actually break down greasy pore plugs, allowing for easier blackhead removal during cleansing. (If you normally apply moisturizer, do so after the toner has dried. Be sure to select a light-weight Gel Moisturizer for Oily Skin & Acne). Many will say this is a crazy suggestion, but for those with extraordinarily oily skin it works! The Magnesium in this product is highly effective at absorbing oil, and provides a completely matte base before foundation. To use, dip the top of a cotton ball into Milk of Magnesia (original formula, unflavored). Swipe the cotton ball over your T-Zone on nose, forehead, cheeks & chin, so that just a nearly transparent layer of wetness can be seen. You don't need to use much & it will dry to a slightly white finish, but will become invisible once foundation is applied. Allow to dry completely for about 3 minutes before moving to the next step. If you are leery of applying the Milk of Magnesia to your skin, this step can be skipped. People with exceedingly oily skin will find it to be very helpful in keeping a matte complexion. Unless you have a sensitivity to Magnesium, it should be harmless to your skin and not cause breakouts or clog pores. Using the right primer is an important step in preventing clogged pores and achieving a matte finish. When this step is skipped, skin oil absorbs into foundation, causing it streak and fade. Mattify! Cosmetic's ULTRA Powder is the best primer for oily skin because it absorbs oil throughout the day and prevents makeup from lodging into pores. Unlike most cream or gel primers (best for dry skin types), ULTRA Powder does not leave behind a greasy residue. This silky transparent powder allows foundation to glide on, imparting a clean, poreless finish. It also helps prevent oxidation, so your makeup stays color-true. Using a powder brush or puff, apply the ULTRA Powder over your entire face (including eye lids) as also acts as a primer for crease-free eye shadow. **NEVER select primer that contains silicone, unless you have dry skin! Silicone gel (dimethicone) is a very common ingredient in liquid primer. It burrows deep into pores trapping oil and bacteria, leading to acne breakouts and, even worse, cystic acne breakouts - which can take weeks to heal. Dimethicone is also a common ingredient in foundation, but is normally used in smaller percentages than in primer. Be sure to thoroughly exfoliate and cleanse your face after wearing any product that contains Dimethicone, and use a purging mask weekly. To protect skin from this type of foundation, be sure to use ULTRA Powder first, before makeup application. "List of the Best Foundation for Oily Skin"
To achieve a perfectly matte complexion, be sure to look for foundations that are labeled: oil-free, oil-absorbent, matte, waterproof, water based, and/or long lasting. These function best on oily skin types, and are highly resistant to decomposition from skin oils. Liquid makeup can be applied using a foundation brush, beauty blender or finger tips. Dab a bit of foundation on cheeks, chin, and nose, then blend using downward motions. Repeat this process on forehead, but blend upwards toward the hair line. If using mineral foundation, blend into skin using Kabuki Brush in circular motions. You've probably heard the phrase "oil and water don't mix", right? The same goes for oil and water-based foundation. Since skin oils can not absorb into water based makeup, this blend is surprisingly long lasting on oily skin types. Water based makeup is especially beneficial to those with oily acne prone skin, as it does not clog pores or cause breakouts. Try the Dinair brand of makeup on our list below, which is not only long lasting, but is also is a water resistant foundation! "Best Powder for Oily Skin"
​Setting Powder is your final line of defense against oily skin. It provides a silky finish over foundation that absorbs oil, to help prevent streaking and transferring. With the right setting powder, skin will look matte and poreless. Mattify Cosmetic's Ultra Powder is by far the best powder for oily skin, as it's the most oil absorbent face powder on the market. (This is the same powder suggested as Primer in Step 4). This powder controls oil for hours, to keep your face looking matte and foundation looking freshly applied. After foundation & other complimentary products such as blush and bronzer have been applied, use a fluffy powder brush to apply Mattify Powder for Oily Skin. You can also use a powder puff, for more concentrated oil control. Press (don't rub) the puff onto skin and roll back & forth until the powder goes from white to transparent. If you normally use a colored setting powder, apply Transparent Mattify! Powder first, then your regular colored powder. The Mattify! Powder will ensure a matte look that never looks cakey, and provides 5 times more oil control than regular face powder alone. Voila! You now have long lasting makeup for oily skin. Keep a jar of the Transparent Mattify Powder with you for touch-ups throughout the day, to keep skin matte. If your skin starts to get oily, you can use an oil blotting sheet & apply more Mattify Powder, as this process won't disturb your makeup. Be sure to avoid setting powder or foundation that contains mica, bismuth, or pearl powder. These are all reflective ingredients that will cause your face to look shiny all over, rather than matte. Mattify! Transparent Powder and Tinted Foundation for oily skin are both 100% Matte, and do not contain any reflective ingredients. Pearlescent ingredients are best suited to eye shadow and lip products, where you actually want a little bit of sparkle! A matte complexion doesn’t have to be boring! Spice it up with vibrant lip color & shimmery eye shadow. ​Keep in mind that everyone’s skin is different, so some people may react differently to various products, treatments and ingredients. However, all of the items suggested are oil free and suitable for acne prone, oily skin. If you have sensitive skin it is always best to test for a couple of days on a small inconspicuous area near the hair line, in case you have a reaction. ​Heidi Hamoud's You Tube video on How to Bake or “Cook” Your Makeup has become widely popular within the last year & even made an appearance on Cosmopolitan.com. There’s a reason this technique has acquired so much fame; it works amazingly well to provide long lasting, flawless makeup. 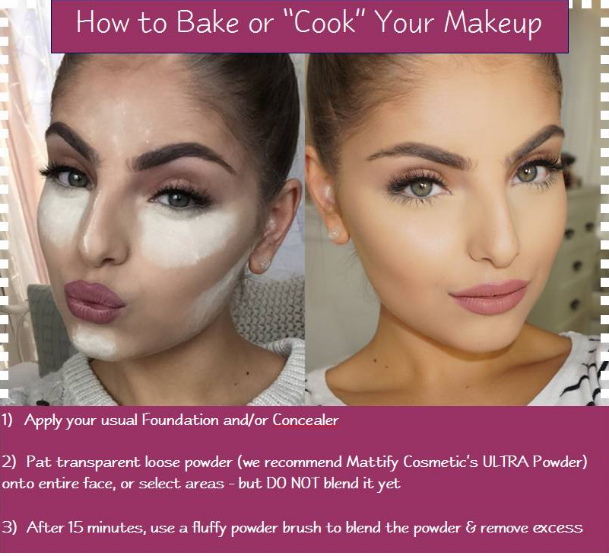 Although this method for long lasting makeup has been in use since the 1970's, it was recently made popular by celebrity makeup artist Mario Dedivanovic - who has proven that cooking your makeup allows it to stay in place, even when exposed to hot studio lights. ​If you have oily skin, you’re already aware of the daily battle to keep foundation in place. It feels damp after a few hours, and smudges uncontrollably. The makeup baking technique allows powder to absorb directly into foundation & concealer – so when oil begins to surface, the powder can act as a first line of defense for absorption. Rather than penetrating foundation, oil absorbs into the powder itself, providing much longer wear. You can apply the ULTRA Powder to select areas where you tend to get shiny, or to your entire face, using an angled brush or thin powder puff. Be sure to let it sit for 10-15 minutes before blending! This allows the heat from your skin to "bake" (or melt) the foundation, allowing the powder to sink in. Once the powder has partially dissolved into your makeup, it stays there to help combat oil for hours. In combination with using Mattify ULTRA Powder as an oil absorbent primer & setting powder, Makeup Setting Spray will add longevity for your finished look. Skin oil is notorious for dissolving foundation, leaving you with a sticky, oily mess - especially during hot, humid summer weather. ​So how do celebrities with oily skin get long lasting makeup when they’re on set under hot studio lights? How to some women manage to look flawless at the beach or pool? You guessed it – they use makeup setting spray. ​This is an all-important step in any makeup routine, if you have oily skin or will be exposed to overly hot temperatures or damp environments. Setting spray forms a light barrier over your face, ensuring that these makeup busters won’t ruin your look. Some quality makeup setting sprays on the market include: Model in a Bottle, Urban Decay All Nighter, Skindinavia No More Shine and Ben Nye Final Seal (now sold on our Mattify website). If you have oily skin, just be sure to avoid any setting spray labeled “dewy” or “water-based” which will cause your makeup to look sticky. ​Selecting one of these top 3 oil-control face powders is a must if you're dealing with oily skin. A quality matte powder absorbs oil throughout the day, to prevent the clogged pores and streaky foundation, that often result from overactive sebaceous glands. "Matte Makeup for Oily Skin"
​Lost in a sea of makeup products claiming to be designed for oily skin, but you end up with a sticky “dewy” finish? Check out this list of oil-control makeup products for oily skin that will keep you looking matte and shine-free all day, with minimal touch-ups! ​To control oil and acne, it's best to use a toner that balances the skin's natural pH levels. When skin in balance, it stop producing excessive amounts of oil. Also, pH balanced skin is not overly acidic - so acne bacteria can not flourish. This blog describes how 1 natural product may be the only toner you will ever need. ​Powder primer is the best option for oily skin, because it does not clog pores like silicone based primers often do. The article describes why dimethicone (silicone) clogs pores and lists the benefits of using Mattify Cosmetics Ultra Powder as a primer under foundation. Learn how to prevent acne and blackheads - while also controlling oil. ​"What Causes Oily Skin & Acne?" ​The science behind oily skin & acne. Exactly what causes these difficult-to-handle skin conditions? Once you know the cause, you're better prepared to find targeted solutions. Also read info on the latest acne treatments, plus a Q&A section dealing with common myths surrounding skin care. Do Certain Foods Cause Oily Skin & Acne? Beauty begins from within! If you body isn't in good health, chances are it will reflect in the condition of your skin. The owner of Vegan Beauty Review (who specializes in rounding up the best vegan & cruelty-free makeup products) bring us "20 Health Benefits to Going Vegan" - which includes how improving your diet can benefit your skin. Acne.org provides hundreds of forums where users can post and answer questions about acne and oily skin. Also contains reviews on products for acne prone skin and lists highly recommended treatments. This Beauty Blog called Thank Your Skin discusses skin care tips for oily skin & acne prone skin. It includes helpful product reviews, skin care advice, and the best skin care routines for various skin types. This website specializes in fantastic products for acne prone oily skin such as: liquid salicylic acid to treat acne, buffing crystals for exfoliation, serums to boost skin clarity, and chemical peels to reduce the appearance of acne scars. Another top site among those with acne prone oily skin, this company provides an array of peels to unclog pores and smooth skin that has been affected by acne scarring. They also offer botox alternatives and stem cell skin treatments. This amazing product is a must-have if you're dealing with oily skin. Adding a drop to any powder eye shadow will make it waterproof (which also means "oily-skin proof". Your eye makeup or liner will now last all day, even through swimming & high humidity!